Today it’s exactly three months since my eye surgery. I’m not sure what to think of it, given that it failed in all respects. That is, it did give me clarity about my prognosis, ie. total blindness for the rest of my life, but I’m not sure I’m adjusting ot this well. It constatly strikes me that I don’t really miss stuff that comes naturally to the sighted, like reading or independent mobility, but I do miss stuff that came naturally to me. I don’t wish to become sighted, and this is not even because it’s unrealistic. Becoming a low partial again is equally unrealistic now, and I do grieve that. About eight years ago, I drafted a few responses to Robert Leslie Newman’s Thought Provokers, which were story-based discussion topics circulating on blindness E-mail lists in the late 1990s and early 2000s. One of the stories was about sight restoration. I just thought of this. When I was twelve in 1998, my father came up to me with some new research he’d heard about that would allow blind people who had previously had some sight, to see through a computer chip or something like that. They were testing the thing with sighted people at the time and planned on testing it on blind people by about 2005, he said. “So when you’re in college, you might be a participant for the research,” he said. Not only did I not get into college by 2005, but his ideas were likely totally off-base. I have been severely visually impaired my entire life, in 1998 had some useable vision and now have none, and those equipments would most likely not work for my eye condition, since many require a retina to be attached to the back of the eye. At that time, I didn’t think about the research much. I had recently lost some of my vision and was scared of losing more and all I thought was: “By 2005, I won’t be totally blind.” When I originally wrote this comment, I said I wasn’t, but realistically speaking, I was. I don’t have all the facts, but it seems to me that in 1997 and 1998, there was some hype about the possibility of blind people getting their sight back. I know about blind people like Stevie Wonder wanting to see for a short while, and I think he even had surgery so he might see for a few minutes (I don’t understand the technicalities) a few years back, but I never quite wished that for myself. In a way, this is strange, since I used to be about as poorly adjusted to my blindness as could be, given my situation. However, I’m realistic and I know that artificial vision doesn’t work for me at the moment, and vision for a short while would be useless. As I looked for the above comment, I came across several other drafts of responses to Thought Provokers. One was about which would be easier: being born blind or losing your sight later in life. Another was about whether losing your sight slowly or fast would be easier. I talked in these posts about grieving the sihgt I had, not the sight I never had. This may seem odd, but when thinking aobut vision loss, I always miss seeing colors and some pictures. I wish, for example, that I could use Pinterest. Oh wait, I never had that ability and if Pinterest had existed in 1998, I wouldn’t have been able to use it. (I remember having tried to use a mouse but failed.) I guess after all what I miss are the things I could enjoy with viiion. I don’t miss reading print because I’m pretty proficient in braille, and I never cared much for independent travel so I don’t miss that either. What I did care for, and still do, are crafts, pictures and colors. Especially colors, and these can’t be repplicated non-visually. When I showed my first handmade bracelet to the staff on my ward, several nurses requested I make one for them. It took me severl weeks to get this one finished, and so far this one nurse is the only one who’s given me specific directions on what to make for her. 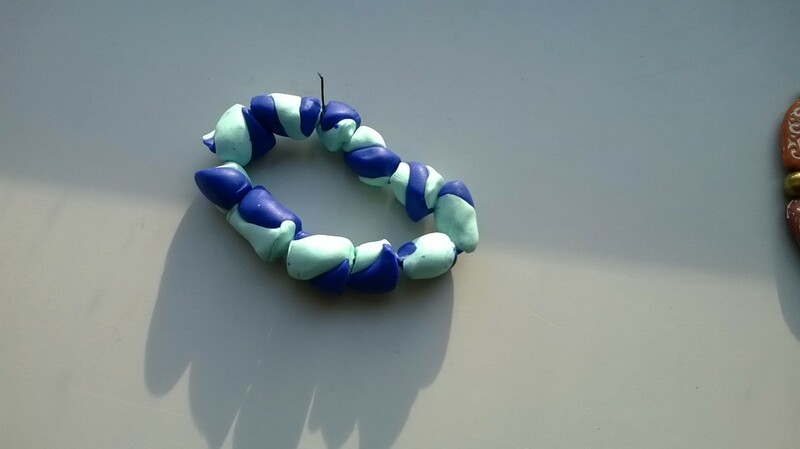 The beads are made of two colors of polymer clay selected by the nurse from my stash. They are ultramarine Fimo Classic and pastel mint Fimo Effect. The mint may look a bit blueish and I at one point thought I might’ve confused it with the blue ice quartz. As with another bracelet I’ve previously posted, I rolled the two colors of clay into a jelly roll. I really need to learn to make canes, but will get to that later. I got very uneven beads from my first try so made some more and chose the best I had. They’re still each more different than the ones on the other polymer clay bracelet I’ve made, but they’re okay. As usual, I strung the beads onto elastic wire. I fear the bracelet is a little too tigght, but we’ll see. Forgot to take it back to the ward when my husband had photographed it, so the nurse will need to wait to get it. Over at The Squeaky Wheelchair, I found a sad story (with a happy ending) about a child with a neurodevelopmental disability and a heart defect being denied a heart transplant based on lies and misconceptions about his perceived quality of life. I do not know anything about Maverick’s syndrome or the risks it causes in cases of heart transplantation, so there is still a chance thAT Maverick’s parents sought to minimize the risks of infection in order to make him a more hopeful candidate. Then again, the doctors were making up different stories about why Maverick would be denied a transplant, and his neurodevelopmental disability apparently did play a large part. This is sad, because, unless truly the risk of infection or tumors is increased with this syndrome, the improvement in quality of life for Maverick would be at least as much as that for a non-disabled chhild undergoing heart transplantation. I feel compelled today to write about the opposite attitutde, one where improvement matters at least as much as perceived normalcy of outcome. My story did not have a happy ending, but that was not the doctors’ fault. The story involves my being approved for cataract surgery this year. This is not as complex a surgery as a heart transplant of course, but it does prove that some doctors are willing to take risks (again, not as big risks as with a heart transplant) for an outcome that may seem futile to non-disabled people. Those who have visited the various places on which I’ve blogged over the past half a year will know the facts of my story already. I was born three months premature and developed an eye condition that’s relatively common in premature babies. From this condition, I have been legally blind, with as best a visual acuity of about 20/400 to 20/800 with a restricted field of vision, all my life. When I last went for a regular eye exam at age nine, my visual acuity had dropped to the ability to see someone’s hand move at measuring distance. I was considered functionally blind. I developed a cataract in my only eye which had useable vision at aroung age fifteen. By age seventeen, it had grown so much that I’d lost all but light perception. I never sought treatmetn, assuming that no doctor would be willing to remove the cataract given the perceived outcome. Until 2013 that is. I decided I wanted to know for sure, and if the doctors at Radboud University Medical Center would decide against surgery, that’d be fine with me. (Of course, the decision was a joint one ultimately, but as Maverick’s case shows, sometimes doctors deny care based on perceived futility, and they have a legal right to.) I went through eye exams and my old records were read. Then the doctor gave me the facts – the best outcome would be hand motion vision but there was no way of knowing whether I’d get any improvement until after surgery and there was a risk that I’d lose my remaining light perception. He gave me the choice and I went for surgery. Unfrotunately, it did not result in any improvement. Now please realize that hand motion vision, as I said, is considered useless by most. This is understandable, but from a disabled perspective, and the doctor was the first to actually say so, it is a significant improvement from no sight at all. The outcome may objectively have been futile, but subjectively, it could’ve been significant. Now let’s go back to Maverick’s story. I am not one to say that any life is better than death, but this is not up to a doctor to decide. Only the patient (and I’m still unsure about the parents in cases of children) can know whether life is valuable to them. Doctors can advise on possible risks and outcomes, and sometimes the risks of the treatment failing outweigh the benefits (as may’ve been the case had Maverick’s condition in fact led to more infections or tumors). As I said, doctors have a right to decide treatment is futile. I could’ve understood this in my own case, and as I said if Maverick truly ran an increased risk of complications. This is quite different from considering a life not valuable because it is lived with disabiities that are irrelevant to the conditin being treated. I’m currently reading We’ve Been Here All Along, a collection of poetry and essays by autistics over age 35. I may post more about it when I’m finished, but for now, I want to talk about the bias in the publication: all autistics whose contributions I’ve red so far, are reltively capable, eloquent, language-type Aspies. This may seem logical given that the contributions are written, but I for one know of a few non-speaking autistics who can write. They don’t make it into autistic literature as often, but they exist. The bias favoring more capable autistics also a bit annoyed me. Where are those older autistics who aren’t parents or in relationships, don’t have jobs, and don’t live independently? We aren’t all Temple Grandin, you know? This bias is common in autistic literature, but it also perpetuates the myth that less independent autistics need their parents to speak for them. I for one am a moderately able autistic, being in a relationship but not living on my own or ever having had a job. I so badly want to hear from other autistics who need intensive supports. Maybe that will dismantle the myth that only those who presumably can’t speak for themselves, need or deserve these supports. Then again, there is also the myth that those who need intensive support, shouldn’t speak for themselves unless they say what the staff want to hear. And then there is the idea that those who aren’t as capable and are still speaking for themselves, are more capable than they are. That in particular frustrates me, because this myth contributes directly to my likely not ever getting the supports I need. I went to the gastroenterologist last Wednesday, who said I may have irritable bowel syndrome. This diagnosis used to be pretty controversial. It ws only years ago that I heard a doctor on TV say that we used to sit through abdominal pain without complaining and now we take meds for our irritable bowels. I thought of this when I read a post by Dawn Santos on needing permission to voice our pain. Dawn said she’d tell every normal person who’d complain like she wanted to, to seek counseling. Her post is meant to validate those with chronic pain conditions that they have the right to complain, but as a person who’s suffered from abdominal pain and other symptoms for years without having a diagnosis or often being visibly in pain, I want to say it doesn’t matter whether you are or appear normal. I am not saying that chrnic pain is not worse than being in pain only every once in a while. What I do say is that the dichotomous line between healthy and ill is arbitrary. I recently read an interview with another doctor, who said he has some form of arthritis but considers himself pretty healthy. I on the other hand have considered myself somewhat ill for some years now, despite not having a diagnosis. I can see why my attitude is not as upbeat as his, and there are many factors to this. Pain levels may be one (I have no clue in how much pain this doctor is on a regular basis). Psychological factors like coping mechanisms, attribution style etc. contribute too. You may not be able to see whether someone has a chronic pain condition or not. Besides, mental health problems are real problems, too, and Dawn’s comment about counseling made me feel that it’s merely a bad attitude. I want to say that no-one needs permission to voice their pain. Of course, it’s best if you stay somewhat positive and don’t complain all the time, but as an onlooker, you can’t see how much effort someone puts into getting through the day with some level of positivity. Therefore, this should not be a reason to judge someone’s complaining. Getting fed up with it sometimes is okay, but that’s true whether the other person has a (known) chronic pain condition or not. Over the past week, I’ve been having a hard time of it at my ward. I decided on Sunday that I wanted to leave and go backt o my old city institution. Then over the week, I participated in some day activities on my ward, in the activity building and in the multipurpose room at another adult long-term care ward. This made me realize that at least day activities are much better here than they were in my old institution, and I softened up a bit. I had a talk with my therapist on Thursday, and this made me decide I don’t want to leave for now. This talk contributed to that decision, but the good experience I’d had going to day activities did more. I’ve heard on some institution wards day activities are not provided, because the clients need to learn to occupy themselves. This, in my opinioon, is the biggest horse manure around. Currently mentally healthy people have a job, too, so why shouldn’t those who are too disabled or ill to have a regular job? Most people here go to some kind of industrial arts type of day activities, so it’s actually real labor. For some, like me, this is not suitable, and they end up doing arts and crafts. This may seem more like a replacement of leisure rather than work, but don’t mentally healthy people have a variety of jobs, too? For some mentally ill people, just getting out of bed is hard work, and simple day activities can provide them with the structure that a job does, too. There are many benefits of day activites. Some of them, like a daily structure, are applicable to real jobs too. Others, like distraction from one’s mental health problems, are not, but that doesn’t make them any less useful. Becoming mentally healthy, after all, involves more than being able to do a regular job. I for one find that day activities provide me with meaning to my days, structure, as in a reason to get out of bed, social interaction, distraction, and enjoyment. Day activities are in my opinion more beneficial to my mental health than the psychotherapy I get. This is one reason I’m willing to put up with somewhat unsuitable psychotherapy in exchange for much more suitable day activities. Now let me get this real clear: I wasn’t freaking asking for attention per se, I was asking for a talk about a specific subject. If all I needed in my mental health care was enough attention, why would we hire expensive nurses, social workers and psychologists for it? Couldn’t a high school student meet the same needs? The thing is, in reality sometimes all people need is attention, and this is all understandable given that most mental health inpatients are rather isolated. That’s why I advocate volunteers or inexpensive workers being hired by mental health agencies to provide activities or a simple chat about the weather with the patients. That walk and coffee break didn’t require nursing supervision. Then again, that talk I wanted to have surely did. I didn’t touch here on the connotations of the attention-seeking presumption, which are that mental health patients, and especially those with a certain diagnosis, like BPD, have an excessive craving for attention. Well, I for one don’t. I probably spend less time interacting with people than most currently mentally healhty individuals. I may sometimes draw attention to me in a negative way, but that still doesnt’mean I do it for attention. Let me just say I hate that attention paradigm that keeps floating around in mentnal health and especially personality disorder care. I’ve not made much jewelry lately. In fact, this piece is over a month old, but I never got down to posting it. It is intended as a Christmas present for my sister, and I want to make another one (with different beads, but I’ve yet to decide what I want besides rose quartz) for my mother. 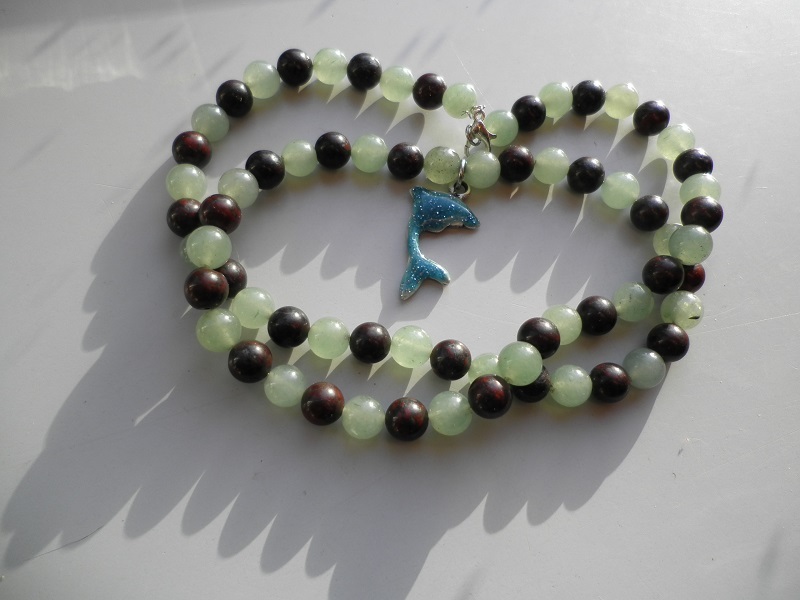 The green beads are aventurine and the brown ones are jasper. I didn’t know there’s brown jasper until I foudn these. I bought them at a lovely shop that sells all kinds of gemstone beads. I can’t remember what the dolphin is made of. Since my husband photographed it, I don’t know what side of the dolphin is visible. It is blue on one side and metallic (I’m thinking silver) on the other.